If you're looking for a good book, our English teachers have put together a list of some books they feel are compelling, interesting, and will change your perspective. Please see the above Recommended Book List. Happy reading! English 1: This course is a standards-based foundational course for freshmen and is designed to provide an opportunity for students to continue their study of reading, writing, speaking, and listening. Students will read a variety of literary genres and forms. From paragraphs to essays, writing will be both analytical and creative, with a focus on the writing process. This program emphasizes a variety of critical thinking and language experiences to provide students with strong communication skills and the ability to succeed in and out of the classroom. English I Honors: English I Honors is an accelerated course designed for those freshmen who have demonstrated a superior understanding of English fundamentals. This course teaches students to read closely, delve deeply, and analyze thoroughly both fiction and non-fiction works, and use strong rhetoric and composition skills. Students will read novels, epic poetry, assorted poems, and a Shakespearean drama. Students are expected to write five paragraph expository, narrative, and persuasive essays throughout the year. Oral communication will be emphasized through whole class, small group, and formal presentations. Creative projects will also be offered throughout the year. All essays, discussions and projects will emphasize critical thinking skills and literary analysis. Summer work may be required. English 2: Expanding on the skills developed in English 1, this course integrates the practice of reading comprehension and analysis, vocabulary development, expository, persuasive, and narrative writing applications, research skills, the use of standard English Language grammar and conventions, and effective speaking and listening techniques with a central thematic focus on diverse literature representing various global cultures and heritages. This course emphasizes world literature so that students increase their understanding of individual and cultural experiences. Substantial reading is required, and outside reading and writing are expected. English 2 Honors: Expanding on the skills developed in English 1/1H, this rigorous course will provide a study of multiple genres of challenging literature from diverse cultures around the world. Additionally, continued development of writing skills will focus primarily on composition, analysis, and evidence. Students will spend considerable time developing skills in the following areas: response and analysis of literature; persuasion and argumentation; and evidence gathering and evaluation. Through various activities including group work, research, and in-depth discussion, students will further develop the reading, writing, speaking, listening, and critical thinking skills essential to success in their endeavors. Substantial reading and writing will be completed independently outside of class. Summer work may be required. English 3: In English 3, students read and analyze American literature from a variety of historical, political and cultural perspectives. These literary works include both non-fiction (journals, expository articles, speeches) and fiction (poetry, novels, drama). Students are encouraged to make connections between literature and history while continuing to refine and practice their skills writing persuasive, expository and narrative compositions. Students also learn to formulate an argument, research information, assess the relevance and credibility of a source, cite a variety of sources and format a document. In both oral presentations and written work, students demonstrate their ability to appeal to their audience logically, ethically and emotionally. Outside reading and writing assignments further develop students‘ vocabulary and critical thinking. English 3 Honors: This junior level honors course examines American literature from its colonial origins to the present, including changes in language, subject matter, philosophies, and style. The literature and compositions are arranged to provide a focus for critical thinking and discussion. This course also includes creative and expository writing, literary analysis, oral presentation skills, SAT preparation, grammar, punctuation, and writing style instruction. Students will be challenged to participate in class discussions and outside reading, and will learn to explore, as critical thinkers, the major themes of American literature and history. Summer work may be required. Advanced Placement- English Language & Composition: An AP course in English Language and Composition engages students in becoming skilled readers of prose written in a variety of rhetorical contexts and in becoming skilled writers who compose for a variety of purposes. Both their writing and their reading should make students aware of the interactions among a writer's purposes, audience expectations, and subjects, as well as the way genre conventions and the resources of language contribute to effectiveness in writing. The course materials and writing assignments prepare students to take the Advanced Placement Exam. English Advanced Placement is an intensive course designed for students who are ready for college level writing. English 4: World Contemporary Literature and Communication is a standards-based course for seniors. Students will explore major literary time periods of the world with a special focus on how these periods influenced Western Civilization and contemporary authors. Additionally, students will work with a number of expository texts, studying rhetorical reading and rhetorical writing strategies needed for success in college, vocational programs, the workplace, and the global community. The curriculum offers a variety of activities such as research, discussion, simulations, individual and group work, and projects. Significant outside reading and writing assignments are required. Advanced Placement- English Literature & Composition: An AP English Literature and Composition course engages students in the careful reading and critical analysis of imaginative literature. Through the close reading of selected texts, students deepen their understanding of the ways writers use language to provide both meaning and pleasure for their readers. As they read, students consider a work‘s structure, style and themes, as well as such smaller-scale elements as the use of figurative language, imagery, symbolism and tone. The course includes intensive study of representative works from various genres and periods, concentrating on works of recognized literary merit. The pieces chosen invite and reward rereading and do not yield all (or nearly all) of their pleasures of thought and feeling the first time through. English Workshop: This is a one-year course designed to offer additional support to students already enrolled in a grade level English course to help students meet grade level standards. 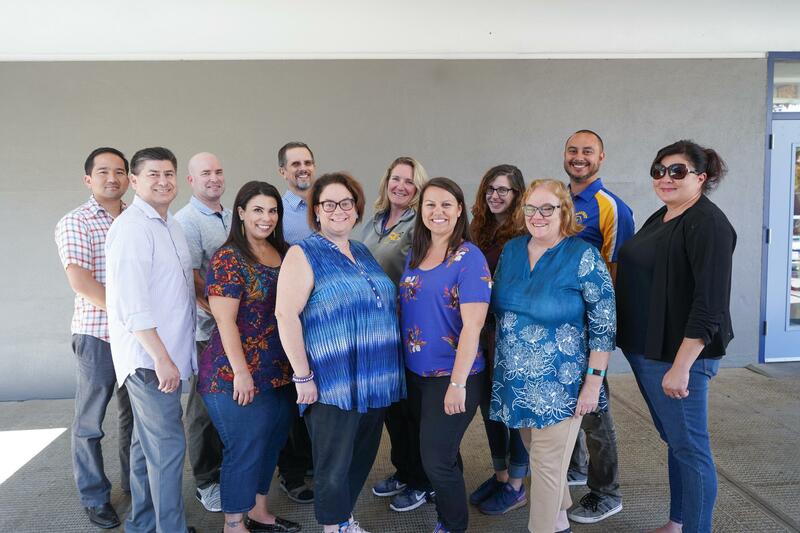 The course will also help prepare students to pass the California High School Exit Examination by focusing on CAHSEE standards such as reading comprehension, literary analysis, writing strategies and writing applications. Journalism: This elective course offers a variety of experiences that teach students how to produce the print and/or online versions of a school newspaper. The course develops skills in news and feature writing, editing, layout, and desktop publishing and improves the students' writing, mechanics, structure, and style. The integration of photography, artwork, and advertising round out the curriculum of this course.